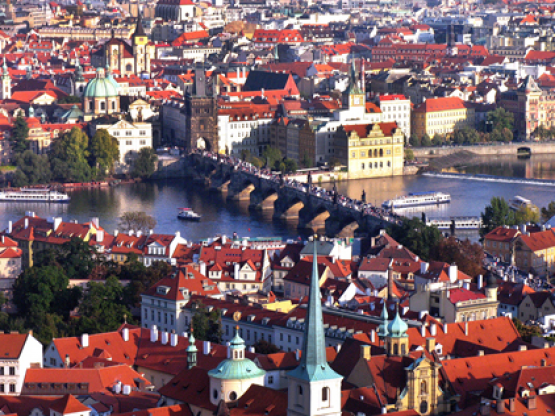 Prague has been the capital city of the Bohemia for more than 11. centuries. It has always been the political, economical and cultural centre of our lands. It was originally founded as a merchants town because it was lying on an intersection of two important trade routes. There is a river Vltava floating through Prague and separating the town into two parts, the right bank and the left bank. In 14th. century it was the biggest town in Europe as it became the centre of Holy Roman Empire. Since 16th. century Prague has not been seriously damaged not even during WWII. and this is a reason why it is so well preserved with hundreds of beautiful sights. Prague has 16 districts but the city center consists of four historical parts. All the important sights in a historical centre are within a walking distance and it means walking is the best way to explore the town. In general, a historical center of Prague consists of 4 different parts so to have an overall feeling of the city these four parts need to be included in your tour. As already mentioned, the river separates the city half and two historical sections are to be found on the right bank of the river and two on the left bank of the river. The first of these is the Old Town which is a medieval settlement originally separated from the outside by a wall and a circular moat on one side, while the Vltava served as a natural protection on the other side. A number of sights are to be found in the Old Town area. Among the most notable we can find the former Jewish Town (Josefov) located in the northwest corner of Old Town heading towards the Vltava and the Old Town Square and Astronomical Clock. The Old Town is surrounded by the New Town of Prague. Founded as early as 1348 it still bears the name New Town as at the time of its foundation it was the youngest of the other four parts. Among the most famous landmarks belong Wenceslas Square, which was originally built as a horsemarket and now functions as a center of commerce and tourism. The National museum, Municipal building and the Novoměstská radnice or New Town Hall, site of the first of the three defenestrations of Prague, are some of the others. On the left bank of the river Vltava connected by the Charles Bridge is the Lesser Town of Prague (Czech: Malá Strana). In the 16th century many palaces of nobility and fine bulidings were built there. Let us mention a few: The most extensive building of the Baroque Era on Malá Strana is the Wallenstein Palace. The finest one and the most prominent church is the St. Nicholas Church. Another famous sight and a pilgrim place is the famous statue of the Holy Infant Jesus of Prague is in the Church of Our Lady Victorious. Kampa Island and the Petřín lookout tower are also located in Malá Strana. The last of the four is the Hradcany, so-called the Castle District, is the district of the city of Prague, Czech Republic surrounding Prague Castle. St Vitus Cathedral located in the castle area is the highlight and a masterpies of gothic architecture. The centre of the town has a medieval layout with squares in the middle and streets pointing towards the squares. It is a good thing to have a map with you and they are provided free either in a reception of your hotel or tourist information around the centre. Town is very safe and you do not have to worry walking around even in the evening. The only unpleasant experience can be a pickpocketing (like in all turist places) and that is a reason why taking care of your belonging is needed. Explore our town with a help of a nice, knowledgeble and friendly local person. A private guided tour will be your best investment. We are sure it will broaden your view of the city much more than if you were on your own or in a group of other people. The time is yours and what we do, how we do it and when we do it, is just and only up to you.